iCubeSat was created in 2011 by JA as a neutral, non-profit, open source, open access forum for anyone with an interest in the concept of Interplanetary CubeSats to present, disseminate and archive their ideas, work, tools, techniques and other relevant items for anyone interested in the peaceful exploration of space. Its first major event was the first Interplanetary CubeSat Workshop which was organised with the help of a committee invited by JA with members with academic, commercial and non-profit affiliations. Funding to allow the workshop to take place was generously provided by more than 150 academic, commercial and non-profit entities and private individuals through donations in kind, sponsorship and registration fees. Locations for subsequent years have been kindly offered by a number of institutions. If you would like to offer your institution as a potential venue, please email committee@iCubeSat.org. The iCubeSat logo graphic contains the famous Voyager 1 ‘Family Portrait’ of the solar system taken 40AU from Earth in 1990. The original picture and diagram with photo captions released by the the NASA/Caltech-JPL public information office can be seen below or on the original source page here. 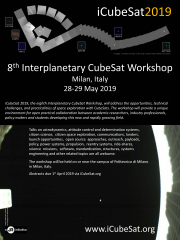 This graphic was chosen as the logo for the Interplanetary CubeSat Workshops in the hope that one day it might inspire an Interplanetary CubeSat to make a similar image and because the square frames echo the shape of a 1U CubeSat. The cameras of Voyager 1 on Feb. 14, 1990, pointed back toward the sun and took a series of pictures of the sun and the planets, making the first ever “portrait” of our solar system as seen from the outside. 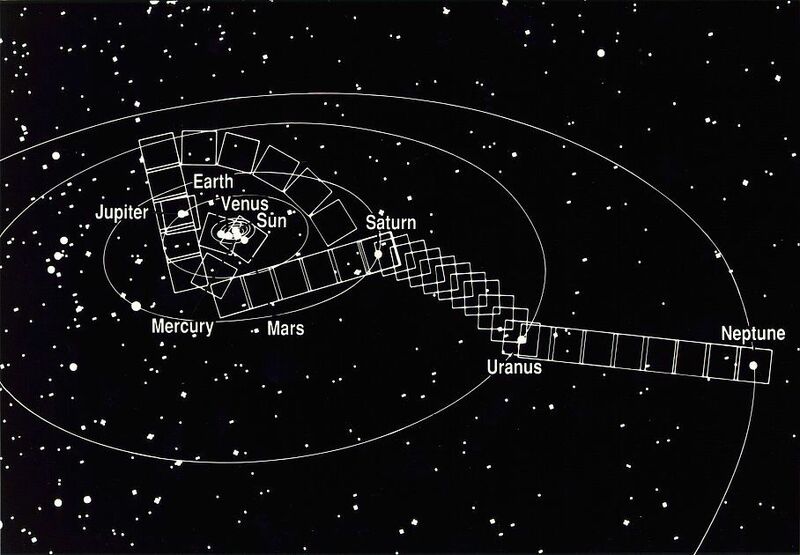 In the course of taking this mosaic consisting of a total of 60 frames, Voyager 1 made several images of the inner solar system from a distance of approximately 4 billion miles and about 32 deqrees above the ecliptic plane. Thirty-nine wide angle frames link together six of the planets of our solar system in this mosiaic. Outermost Neptune is 30 times further from the sun than Earth. Our sun is seen as the bright object in the center of the circle of frames. The wide-angle image of the sun was taken with the camera’s darkest filter (a methane absorption band) and the shortest possible exposure (5 thousandths of a second) to avoid saturating the camera’s vidicon tube with scattered sunlight. The sun is not large as seen from Voyager, only about one-fortieth of the diameter as seen from Earth, but is still almost 8 million times brighter than the brightest star in Earth’s sky, Sirius. The result of this great brightness is an image with multiple reflections from the optics in the camera. Wide-angle images surrounding the sun also show many artifacts attributable to scattered light in the optics. These were taken through the clear filter with one second exposures. The insets show the planets magnified many times. Narrow-angle images of Earth, Venus, Jupiter, Saturn, Uranus and Neptune were acquired as the spacecraft built the wide-angle mosaic. Jupiter is larger than a narrow-angle pixel and is clearly resolved, as is Saturn with its rings. Uranus and Neptune appear larger than they really are because of image smear due to spacecraft motion during the long (15 second) exposures. From Voyager’s great distance Earth and Venus are mere points of light, less than the size of a picture element even in the narrow-angle camera. Earth was a crescent only 0.12 pixel in size. Coincidentally, Earth lies right in the center of one of the scattered light rays resulting from taking the image so close to the sun.